Home How can we treat snoring in children at night? An adult snoring heavily at night is a common scene in the movies. The majority of the adults have been found snoring, lightly or heavily. This is majorly because of aging and the loss of tautness in the nasal muscles. Occasional snoring might show that the person is suffering from a temporary nasal blockage but the heavy relentless occurrence of snoring can be a symptom of a grave underlying problem. The regular snoring of a person, be it a child or an adult, needs medical supervision so that the cause can be determined beforehand and the physiological damages can be reversed on time. Regular snoring in children is the prime symptom of sleep apnea. It needs to be addressed with specific measures to eradicate it once and for all. Sleep apnea not only hampers the sleep quality but will also mess with the overall wellbeing of the child. The effect of snoring can cause various problems in a child. Let us find out the specific effects of snoring. The biggest threat of snoring is sleep apnea. The degree of threat multiplies when the problem is suffered by a child. If not checked, this simple problem will become a grave issue when he gets older. Sleep apnea causes a lack of oxygen in the blood system. The circulation system does not get a proper supply of oxygen due to obstruction in the nasal passage. The lack of flow of oxygen in blood will cause improper cell growth and regeneration. It can result in the deterioration of tissue quality and cause organ problems in the future. Moreover, the child might develop cardiovascular problems in his very early age. This is the reason why the doctors often suggest doing a full examination of the child to find the underlying problem of snoring. A child needs ample sleep to take rest and rejuvenate his body. A study suggests that a child needs a minimum of 12 hours of sleep for the proper mental and physical growth. The lack of proper oxygen flow in his body will also cause improper sleep cycles every night. This means that the child will be unable to complete the amount of rest necessary every night. Snoring will cause excessive irritation, lack of interests, daytime sleepiness, fatigue, lethargy, and various other issues. Even if the child is getting ample time to sleep, he or she will not be able to complete the required amount of rest on time. When a person does not get proper sleep, he becomes cranky. Imagine what will happen to a child who is not getting proper sleep he deserves. A cranky child will become easily irritated resulting in lack of concentration and eating disorders too. It means that the mental development of the child will automatically get hampered. The mental effect of snoring cannot be ignored as it can lead to a bigger problem in the near future. As mentioned earlier, improper sleep and lack of oxygen in blood at night might result in bigger problems such as diabetes and elevated blood pressure. When a child is exposed to such problem in a premature fashion, it might lead to bigger issues such as cardiovascular diseases such as heart disease and stroke. Considering all the symptoms such as overtiredness, lethargy, lack of concentration, irritation, etc during daytime and snoring during the sleeping time may conclude that the child is suffering from sleep apnea. There are various remedies designed for the children to get rid of snoring. Before even thinking of choosing a remedy, it is mandatory to go for a medical consultation to find the reasons first. A child’s body is prone to allergies during a particular season. The immunity system is still developing. In a majority of the cases, the nasal passage of the child is blocked which might cause snoring occasionally. The parents must use remedies to clear out the stuffiness of nose and let the child breathe freely when he or she is sleeping. In this case, a vaporizer is ideal to clear the nasal passage and give ample lumen size for unhindered inhalation of air. Like the adults, the sleeping position of the children also determines snoring. Like adults, sleeping on the back also leads to opening of the lower jaw and relaxing the uvula to touch the throat. On inhalation, the reduced throat lumen vibrates causing snoring. When the snoring child is rolled on his side, the uvula does not touch the throat. Moreover, the tongue also remains in its position. It will automatically alleviate snoring. Another easy way to reduce snoring is to relax the lower jaw by elevating the head and shoulders higher than the back level. The child will not sleep opening its mouth as the lower jaw will maintain its position thus stopping snoring. A slant bed or a small pillow will do the trick. 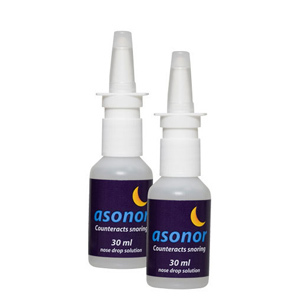 Using anti snoring sprays can alleviate the problem to a considerable level. The children play outside in gardens, grounds, and schools. It is obvious that they will breathe in dust or pollens causing allergies. On sneezing thrice or more, the nose starts producing its fluids. Covering the nose when the child is outside might reduce the number of allergens entering the nasal passage. The use of anti snore solution can be of great help. 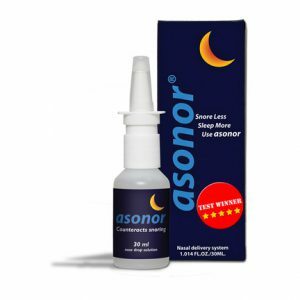 When the actual remedies are being used such as reducing weight, controlling sleeping positions, etc, the use of anti snore solution from Asonor can be of great help. This medically approved solution can easily reduce the degree of snoring to a minimum and the child will be able to sleep properly again. Certain lifestyle changes and prescribed remedies from the doctors will lead to a permanent cure of snoring. The anti snoring sprays will also reduce the effects of snoring and will automatically elevate the sleep quality of the child.